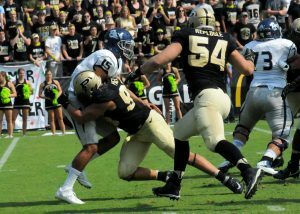 WEST LAFAYETTE – Purdue rallied from a 14-3 deficit to storm past Nevada, 24-14, Saturday afternoon in non-conference football at Ross-Ade Stadium. Purdue cut the lead to 14-10 late in the first half when Bilal Marshall caught a 48-yard pass from David Blough with 1:20 to go. A second touchdown pass from Blough, a 51-yarder to Brycen Hopkins sealed the win for the Boilers, which move to 2-1 for the first time since 2012. Blough threw for 300 yards on 21-30 attempts. Marshall had 82 yards on five catches. Markell Jones carries the ball into the endzone for Purdue. Markell Jones gave Purdue the lead with a five-yard run with 8:03 to go in the fourth quarter, Purdue’s first lead of the game. 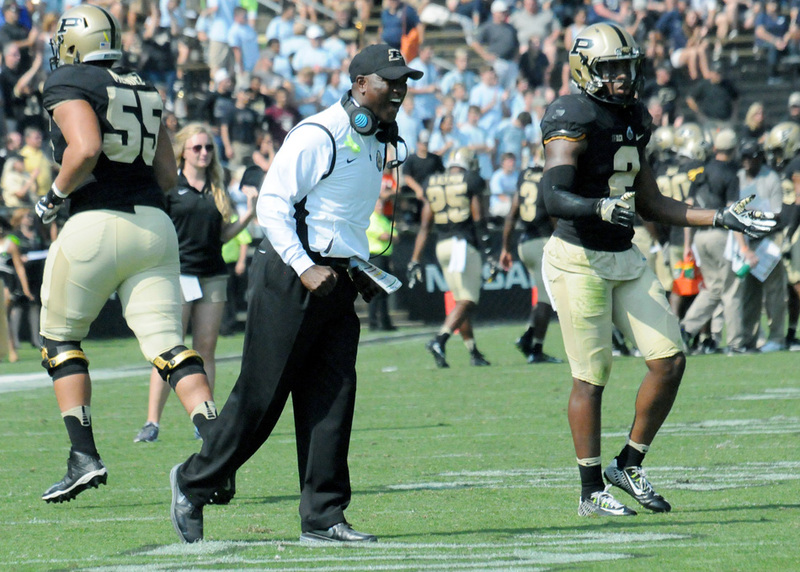 Jones would pace Purdue with 124 yards on the ground on 22 carries. Purdue had 466 total yards in the game, and had five sacks of Nevada quarterback Tyler Stewart. The Boilers also did not punt in the game. Evan Panfil and Eddie Wilson both had two sacks for Purdue, Jake Replogle had the fifth. Panfil had four tackles for loss. Stewart was efficient for Nevada, going 22-29 for 178 yards and two touchdowns, his first to H Henderson for 15 yards in the first quarter. The Wolfpack took a 14-3 lead after Stewart found James Butler for a six-yard pitch and catch in the second quarter. Stewart added 51 rushing yards, Butler with 38 on the ground. Purdue enters Big 10 play next week with a trip to College Park, Md., to take on the Maryland Terrapins, which sit at 3-0 after a bye week this weekend. Bryce Hopkins rumbles into the endzone. David Blough scans the field. Purdue sacked Nevada quarterback Tyler Stewart five times. Bilal Marshall catches a touchdown.